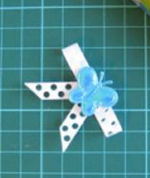 Ribbonstickers are beautiful peel-off sticker borders with a repeating small designs, such as butterflies, hearts, dots etc. With these stickers you can not only provide cards or objects with a nice edge, but the remaining stickers can also be used as background on a card. 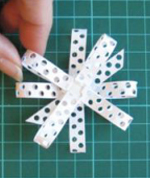 Transfer the 'left over' little stickers using transfer foil. Truly unique is making bows of these stickers. 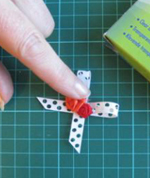 The bows can be used as a decoration and can be decorated with small flowers. Zig Zag Ribbonstickers are classic wave shaped borders that look like Zig zag en give a different look than the straight ribbonstickers. Also this range is suitable to make real ribbons from. Download now the instructions for the making of three different bows.